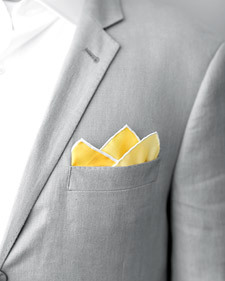 Four different ways to fold a pocket square for your groom or your groomsmen. 1. 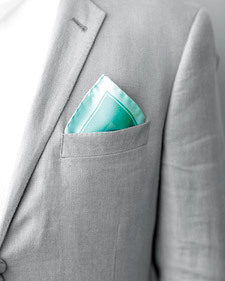 Lay the pocket square flat so it resembles a diamond. 2. Fold the top corner down to the bottom corner. 3. Fold the right and left corners in to the bottom corner, making a smaller diamond. 4. Fold the left, right, and bottom corners of the diamond in to the center. 5. Tuck into pocket with the unfolded corner facing out. 2. Fold the bottom corner up to meet the top corner. 3. Fold the left corner up to the right of the top point, making a second peak. 4. Fold the right corner up to the left of the top point, making a third peak. 5. Tuck into pocket with the folds facing out. 3. Fold side points in just past the center, aligning the folded edge, making 90-degree angles on each side. 4. Tuck into pocket with the folds facing in. 1. 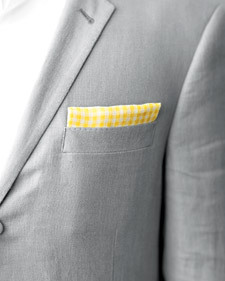 Lay the pocket square flat so it resembles a square. 2. Fold the right side over to meet the left, making a vertical rectangle. 3. Fold the top down just short of the bottom. 4. Tuck into pocket with the folded side up.